According to the Insurance Institute for Highway Safety, in 2008, although large commercial trucks made up only 4% of registered vehicles in the U.S. and 8% of miles traveled, they accounted for a disproportionate number of traffic fatalities. Large trucks were involved in 11% of all motor vehicle crash deaths in 2008 and 69% of truck accident fatalities were passenger vehicle occupants. Out of all two-vehicle crash fatalities involving a large truck and a passenger vehicle reported that year, 97% of the deaths were those in the passenger vehicles. The severity of commercial truck accidents is largely due to the sheer size of the vehicles. The average semi truck with trailer can range from 12,100 pounds to 80,000 pounds, the government even allows an increasing number of trucks to operate at an overload capacity over 80,000 pounds. The immense size and weight of large trucks (25 times the average vehicle and up to 40 times some small cars); coupled with large blind spots, driver alcohol or drug abuse, and most of all driver fatigue or distracted driving; can cause devastating accidents at highway speeds. Driver fatigue and distracted driving are significant and preventable causes of large commercial truck accidents. A Virginia Tech Transportation Institute study found that distracted truck drivers, like those in this year’s devastating Arizona and Kentucky crashes, are 23 times more likely to be involved in an accident or close call. The U.S. National Transportation Safety Board (NTSB) sites driver fatigue as a probable factor in 20-40% of truck crashes. Truckers are required by the Federal Motor Carrier Safety Administration (FMCSA) to follow strict Hours-of-Service (HOS) regulations. 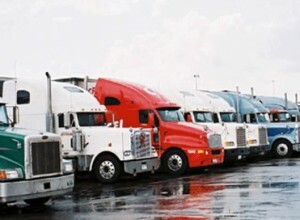 HOS regulations mandate that commercial truck drivers may drive a maximum of 11 consecutive hours after 10 consecutive hours off duty, and may not drive past 14 consecutive hours on duty. Although truck drivers are not to work more than 60 hours during a 7-day period or 70 hours during an 8-day period; a “restart” provision allowing truckers back behind the wheel after 34 hours off, could allow a driver to log up to 77 hours in 7 days or 88 hours in 8 days. Unfortunately, there are often financial incentives for drivers who complete their trips in less time. The Insurance Institute for Highway Safety (IIHS) interviewed truck drivers in 2003, 2004, and 2005; about a third of the drivers admitted to often or sometimes omitting hours from their logbooks. Some truck drivers have been found to keep two sets of books; one record showing the real amount of time the driver has spent on the road, these are the books he/she is paid by, and a second record showing less consecutive driving time in accordance with regulations, these books are presented to the Department of Transportation. The existing penalties for falsifying records or otherwise violating HOS rules are far too lenient and most are only effective after a pattern of violations. Among truck drivers, some even refer to HOS logbooks as “comic books” because they are so easily falsified. Working long hours with little rest can leave drivers fatigued and bored. To avoid boredom, truckers often turn to things that distract them and can prevent them from driving safely. Truck drivers have reported talking on cell phones, texting, reading books or newspapers, using laptop computers, or paying attention to passengers in order to ward off boredom while driving. Last January, the U.S. government finally passed legislation officially prohibiting semi-truck drivers from text messaging while behind the wheel. Most experts see the ban as a step in the right direction, though many are skeptical of highway official’s ability to enforce the ban. Russ Rader of the IIHS believes that is unclear whether or not the cell phone ban will make any difference in terms of number of crashes. Trucking companies need to understand their own responsibility, as well as the responsibility of those entrusted to drive such powerful and dangerous vehicles, in keeping our roads and highways safe. Too many people are injured or killed in preventable large truck accidents. Truck drivers have a duty to exercise care and caution to ensure the safety of those with whom they must share the road. If you or a loved one have been seriously injured in an accident involving a large truck or tractor trailer, the experienced truck accident attorneys at Parilman and Associates can help you. Trucking insurance carriers act quickly after an accident to minimize payouts to accident victims. It is important that you contact a truck accident lawyer as soon as possible after a crash. Please call our office if you would like more information, or for a free assessment of your potential claim. This entry was posted in Blog and tagged big-rig accident lawyers, injury attorney, truck accident injury, truck accident lawyer, trucking accident. Bookmark the permalink.